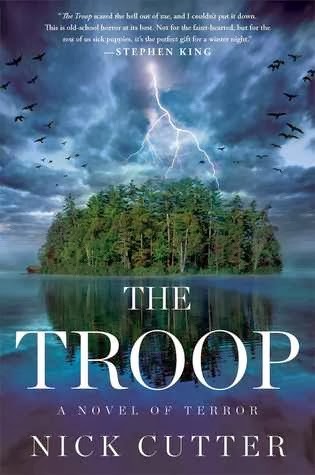 “Lean and crisp and over-the-top....Disquieting, disturbing,” says Scott Smith, author of The Ruins and A Simple Plan, The Troop is a visceral burn of a read that combines boldly drawn characters with a fantastically rendered narrative—a terrifying story you’ll never forget. This book was... gross. But that was only due to the fact that scenes were described so well. I mean, they were pretty gory and I had a hard time reading some of the scenes. I actually had to skip some of them because I wanted to gag a little bit. It was weird because I can usually deal with gross scenes, but in this case I just couldn't do it. The story splits between what is going on on the island where the Boy Scout Troop is and interviews conducted by the government about what happened that caused the events (for example, a scientist who created something bad that spread). I don't want to give away too much, but it makes people so insanely hungry that they will eat anything (though thankfully not humans- if there were zombies this would have been beyond horrifying) while quickly wasting away no matter how much they eat. The content was good, but as I said before you probably need a stronger stomach to get through this. The story was fast paced and kept me coming back to see what would happen next despite the creepy shivers I'd get every time I got to a gross scene. *I received a free digital copy to review.